If you're a big Downton Abbey fan like I am, you'll love this look into the truth behind the manor house where the TV show takes place, and the Lady of the house at the time of the show. 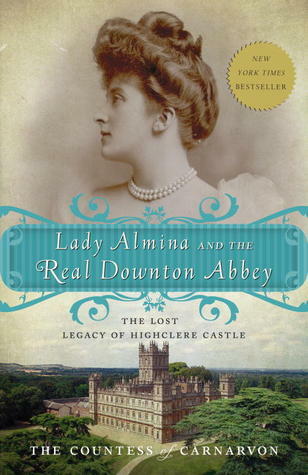 Lady Almina might have not been a lady at all. Yes, she was amazingly wealthy, but she was illegitimate, and that would have stood in her way, even though it was widely known that she was the child of de Rothschild. But Lord Carnavon liked her and needed a big influx of money to keep his estate, Highclere Castle, going. Some plot elements on the TV show, such as converting the house to a hospital during WWI, were taken directly from the Carnavons' life, but most of the show is entirely fictional. Which is good, because the viewing public is unlikely to believe the Lord of the house also discovered King Tut's tomb, but he did! The Carnavons started going to Egypt twenty years earlier to help with Lord Carnavon's unsteady health, as the warm dry air was good for him in the winter, and he loved the archaeology. He tried many other locations first, finding nothing, until a stroke of luck uncovered the greatest archaeological discovery of all time. This book read like a novel but isn't. I do wish it had more information about the servants of the time, but it was captivating and incredibly interesting.